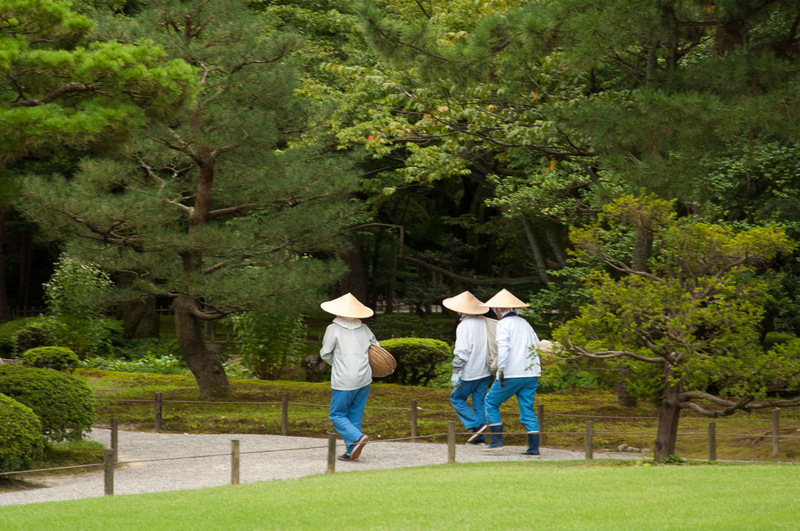 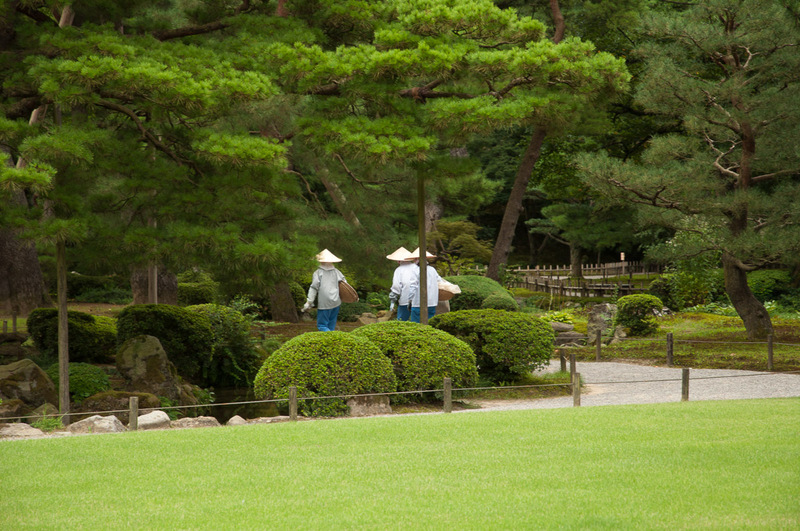 “Deemed one of Japan’s three most beautiful landscape gardens Kenrokuen is a strolling style landscape garden with the characteristics of a typical landscape garden of the Edo period. 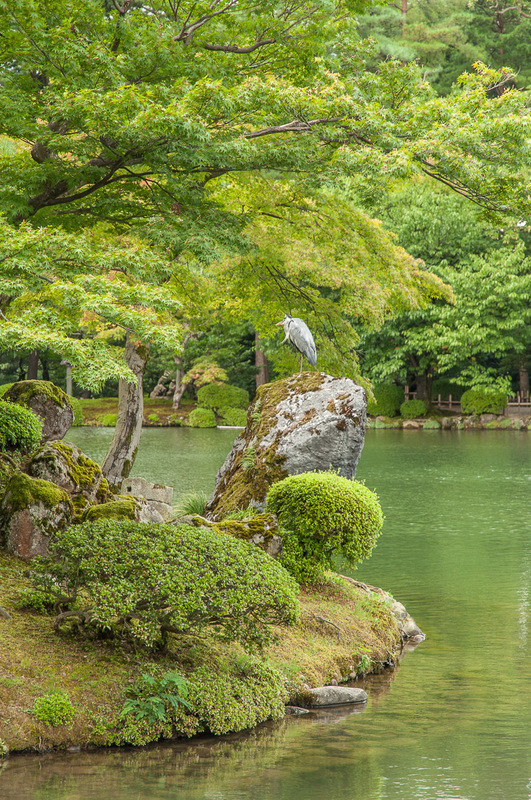 The name Kenrokuen literally means “Garden of the Six Sublimities”, referring to spaciousness, seclusion, artificiality, antiquity, abundant water and broad views, which according to Chinese landscape theory are the six essential attributes that make up a perfect garden. 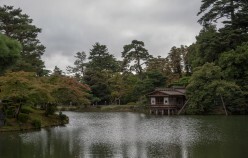 A stroll around Kenrokuen will help with understanding this landscape theory as the grounds are teeming with water features, bridges, teahouses, trees, flowers, stones, viewpoints and hidden nooks to discover.” Thus was the information I had and eager not to miss this intriguing beauty I went for a visit despite the clouds that decided to have a visit on the same day. 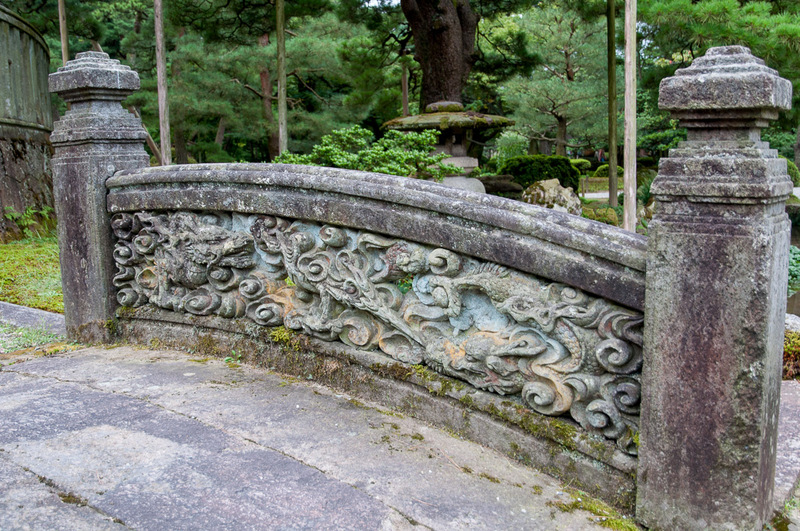 And since it was a day such as this I did indeed have the leisure to stroll around layers of plants and stones and layers of history. 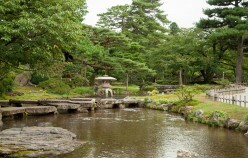 Kenroku-en was developed to perfection over generations by the Kaga clan lords. 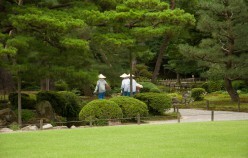 The core concept or rather theme of this gardening, however, was “eternal life” again and again. 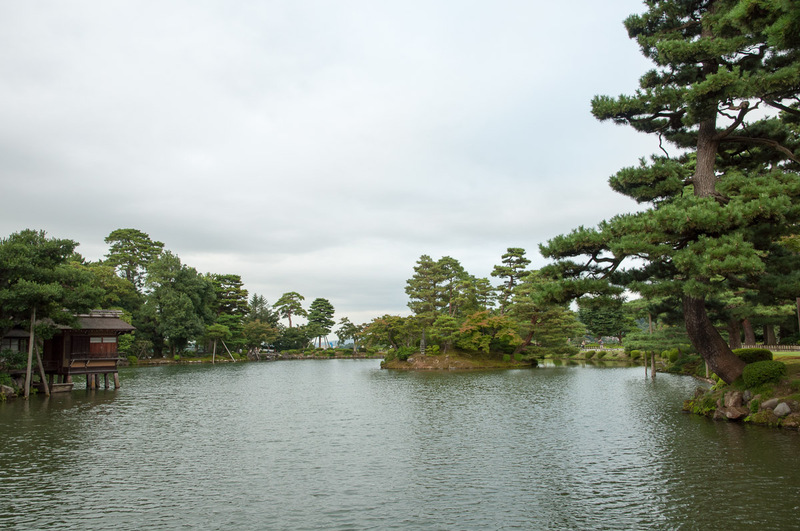 For example, by creating a large pond to resemble the ocean and arranging an island for a legendary wizard with the secret of perpetual youth and longevity to live there, the lords cast their wishes for longevity and eternal prosperity into the design of the garden. 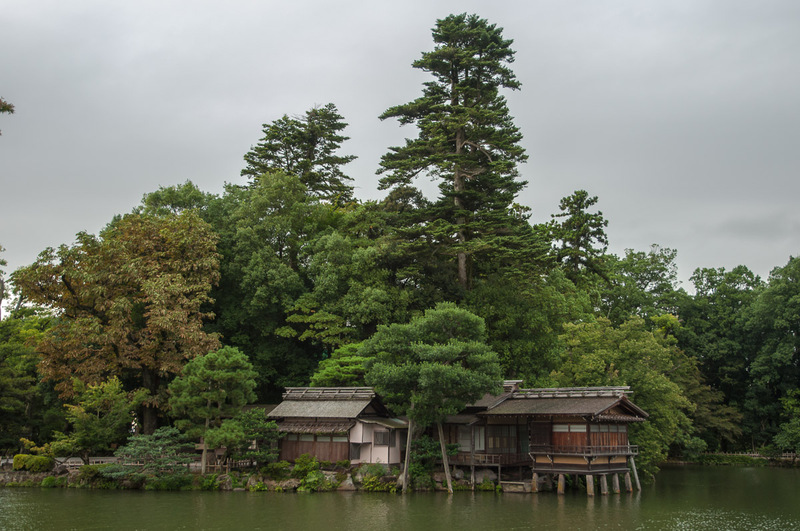 The 5th lord, Tsunanori Maeda, the founder of the garden, established three divine islands, Horai, Hojo and Eisyu, in the Hisago-ike pond, and the 13th load Nariyasu Maeda also built Horai island in Kasumiga-ike pond. So Horai Island is located near the center of Kasumiga-ike Pond. 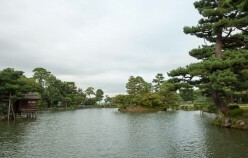 The pond represents the sea, and Horai Island a sacred island. 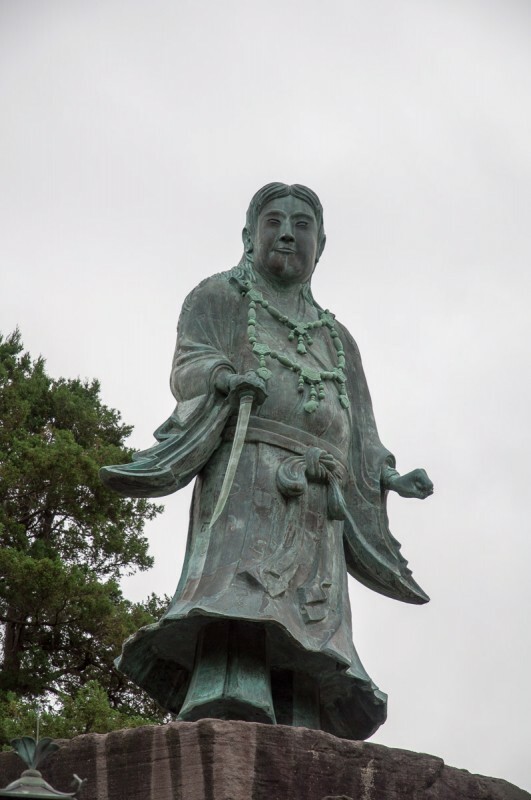 This comes from an old Chinese idea according to which there are three utopian islands far out to sea, which are inhabited by mountain hermits. 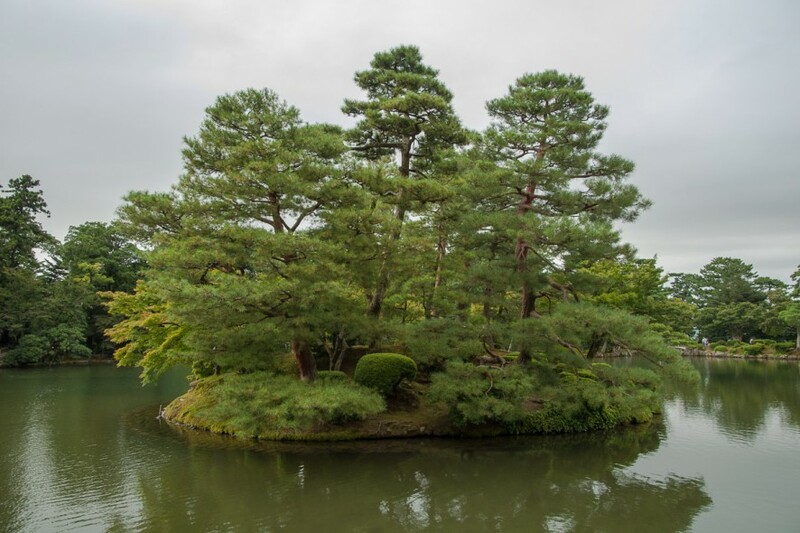 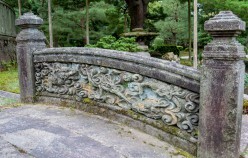 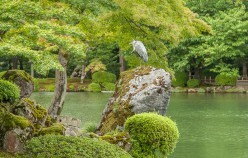 The three islands represent immortality and prosperity, and were often incorporated into famous gardens. 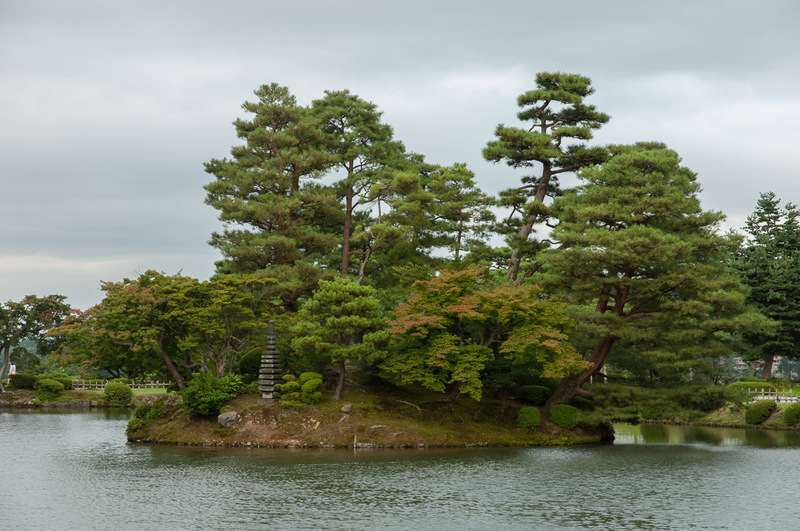 These islands were often the shape of a turtle or a crane, and Horai Island is no exception. 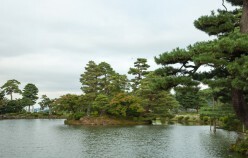 The large black rock on the northeast side of the island represents the head of a turtle, the island itself represents the body, and the pagoda on the opposite side represents the turtle’s tail. The island is also known as “Turtle Island”. 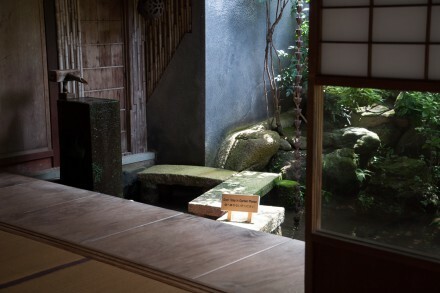 The garden is designed to incorporate particular subjects from other scenery, literature and Noh chant lyrics. 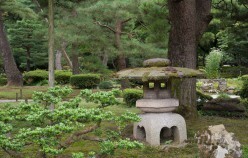 In addition to this, unique Kotoji stone lantern with imbalanced legs and the elaborately designed stone pavement with a diamond pattern. 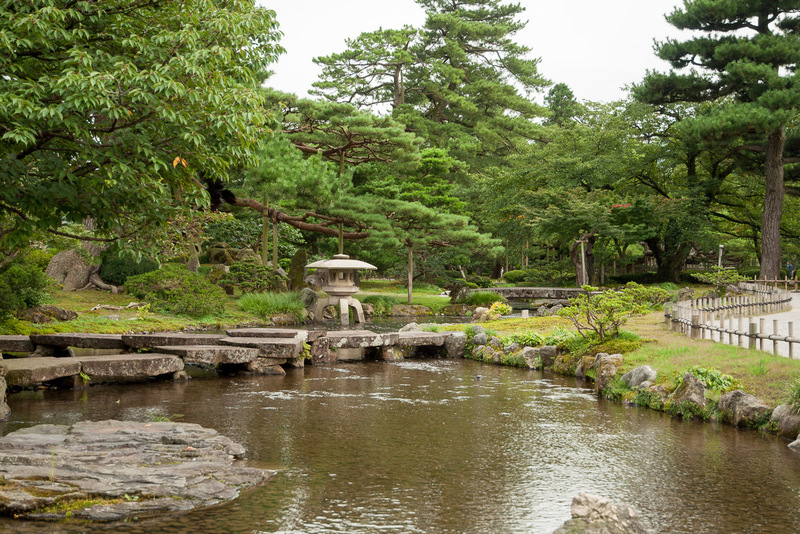 Water is diverted from a distant river by a sophisticated water system constructed in 1632 to feed Kenrokuen’s various streams and ponds including the two main ponds in the garden, Kasumigaike and Hisagoike. 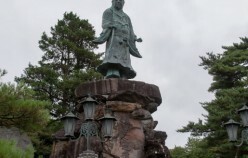 The over two-meter tall Kotojitoro Lantern, uniquely built with two legs instead of one, stands at the northern bank of Kasumigaike Pond and is an iconic symbol of Kenrokuen. In addition, a fountain below Kasumigaike Pond is one of Japan’s oldest, and is powered by the drop in elevation from the pond which causes water to shoot out 3.5 meters high. 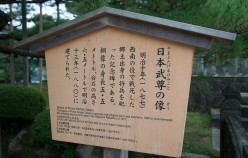 Meanwhile, nearby Hisagoike Pond features a small waterfall. While there is far less foliage in winter, freshly fallen snow gives the garden a different, attractive seasonal look. 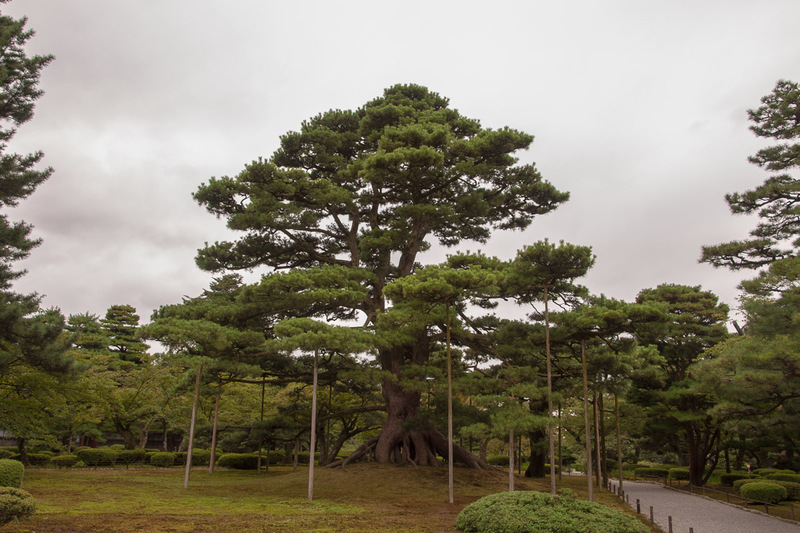 Many of the garden’s large pine trees feature traditional winter protections to prevent damage by snow. 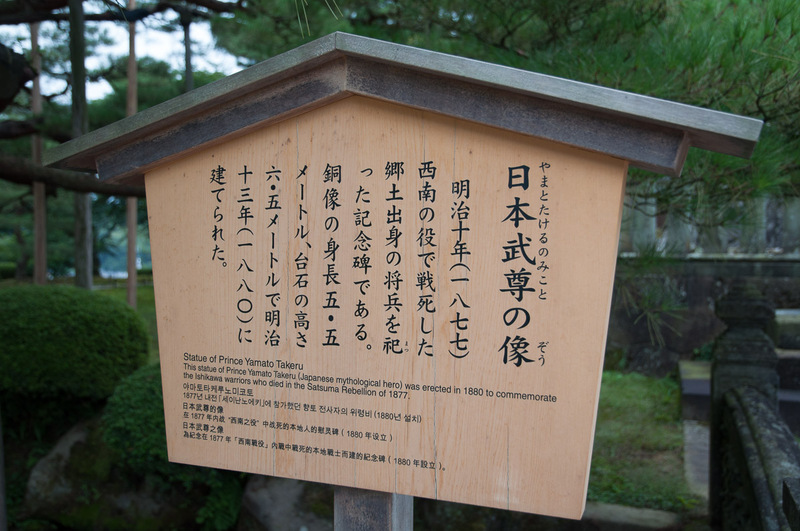 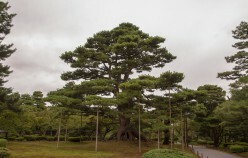 Of special note is the Karasaki Pine, one of the garden’s most prominent trees. 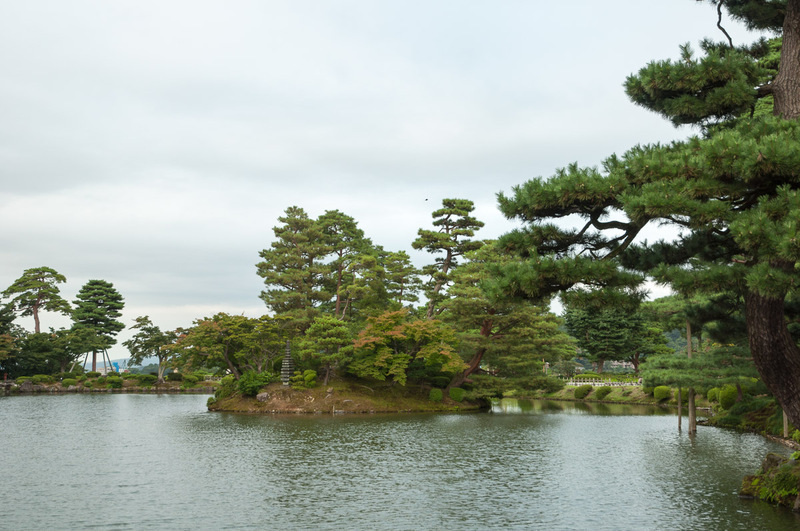 Planted from seed, it now stands tall next to Kasumigaike Pond with some of its branches extending far over the pond’s surface. 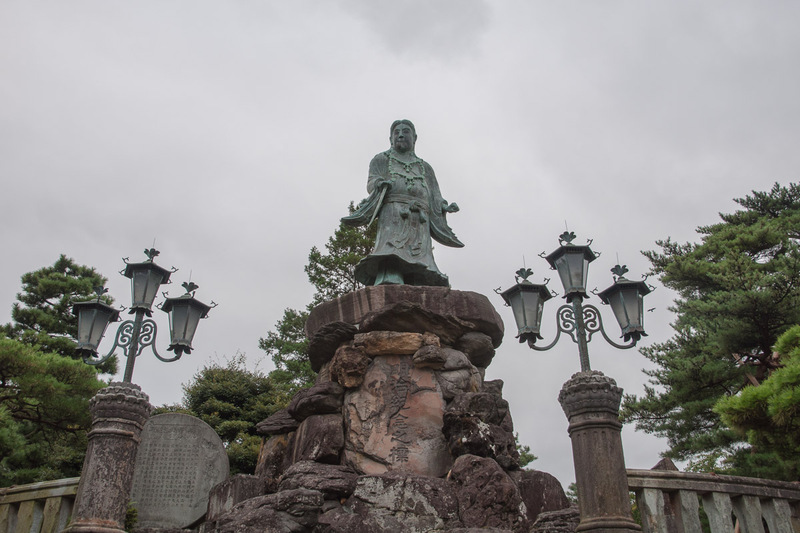 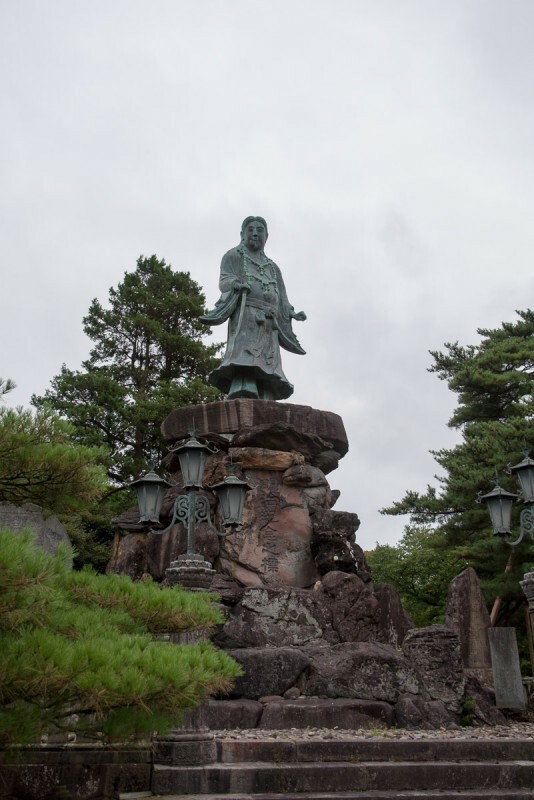 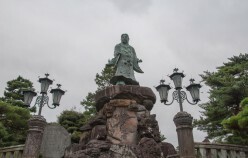 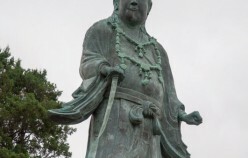 The Statue of Prince Yamato Takeru a Japanese mythological hero was erected in 1880 to commemorate the Ishikawa warriors who died in the Satsuma Rebellion of 1877.